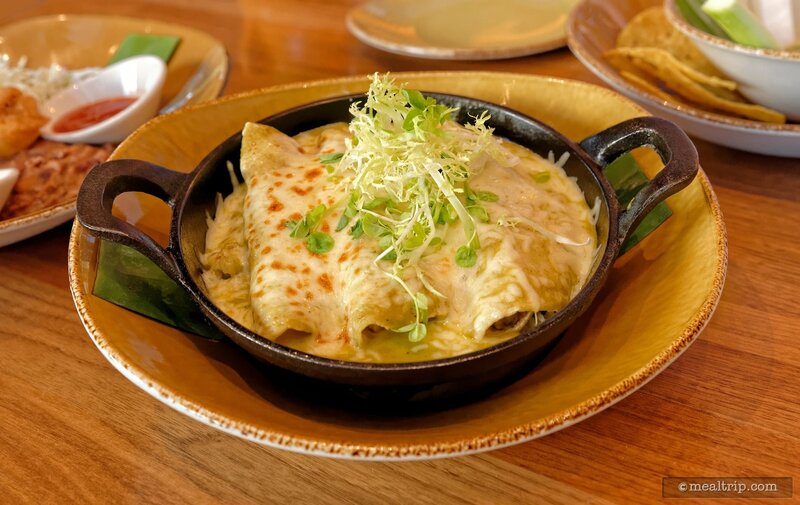 Dip into a lively atmosphere and savor authentic Mexican cuisine by Chef Rick Bayless, an eight-time James Beard Award winner. Step inside and inhale an intoxicating aroma of epicurean delights. As you explore further, you’ll notice unique design elements planted throughout the airy space. Standout features include a fiery ceiling chandelier, an open kitchen and an impressive tequila-laden "Wall of Fame." I was hesitant to go to a Mexican restaurant but game to try anything once. 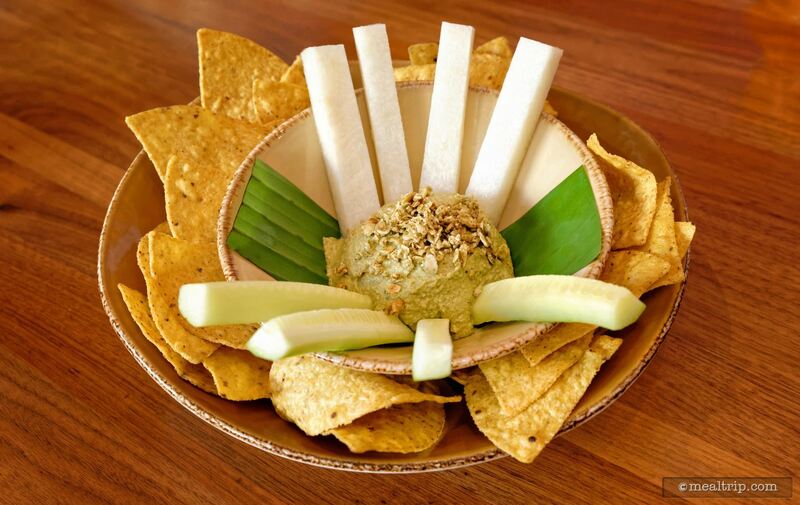 The appetizer of pumpkin seed hummus with the cucumber and jicama spears with restaurant made tortilla chips was a pleasant surprise. The hummus was very tasty the first dish of chips were a bit in the air too long but the second batch were crisp and delicious. The amazing discovery was the jicama spears. WOW. I would like several more spears. The corona was a bitter beer I didn't enjoy. The zucchini, mushroom and potato enchiladas were very bland. I would have liked some sort of cheese to have been melted in with the ingredients. The Paloma tart was o.k. The crust of graham cracker crumbs was tasty but too thick and hard to break off to eat. The service was o.k., being it was noisy so we couldn't hear the waitress. Ladies you have to check out the bathroom. Pay attention to the 1 & 2 tiles on the wall. You will figure it out. 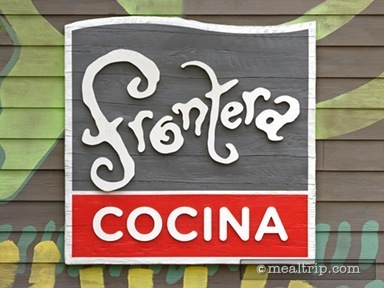 I have visited Frontera Cocina a couple times since it's opening in Disney Springs, but those were for special events. This was my first visit just for dinner. 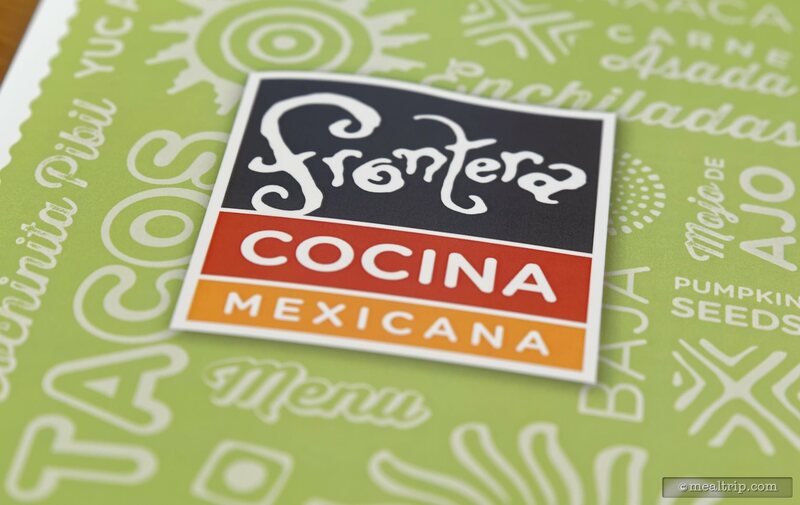 Frontera (so far anyway) has done a really nice job of introducing new seasonal specials and menu items to keep things interesting. My visit this time fell on the very first day that some new items from their "Taste of Baja" menu were rolling out. While some of those items will be replaced shortly with new seasonal items, the new items should be just as amazing as the items that are being replaced. 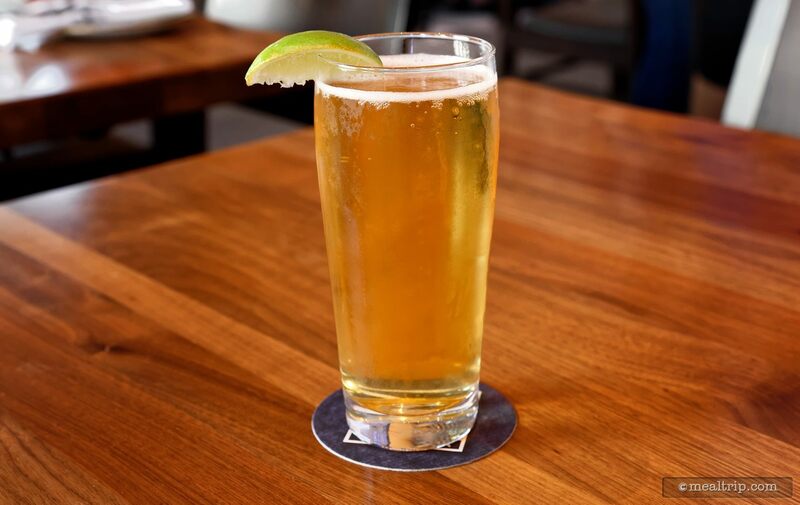 First things first though… there are some "adult beverages" on the menu! Surprise!!!! 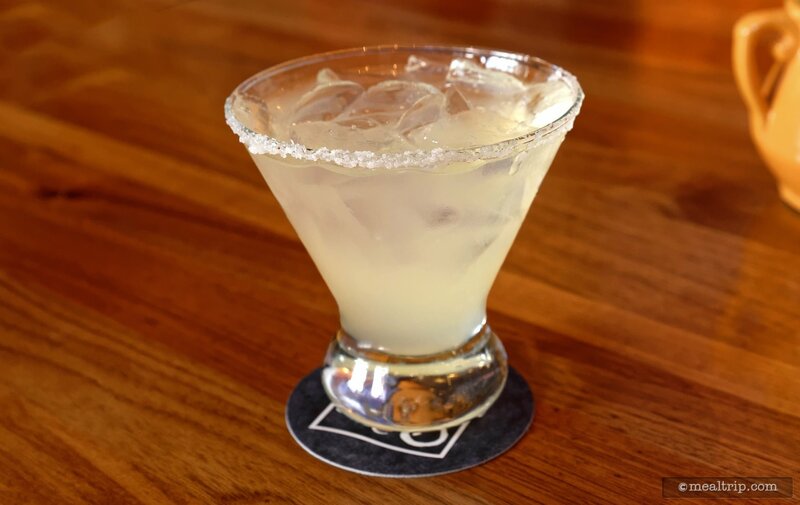 Although not quite as extensive as a dedicated "tequila bar" there are enough custom crafted Margaritas, Tequila, and Mezcal options to pique one's interest over multiple visits. There are a couple of red and white wines on the menu, as well as a few "sparkling wines" which do make for well thought-out pairs with some of the menu items. Several Mexican-themed beers are available on tap or by the bottle as well, (including a couple that aren't made by AB InBev). I haven't managed to try very many "starters" at Frontera because the Toasted Pumpkin Seed Hummus is just so darn good! It's also something I haven't found any where else. 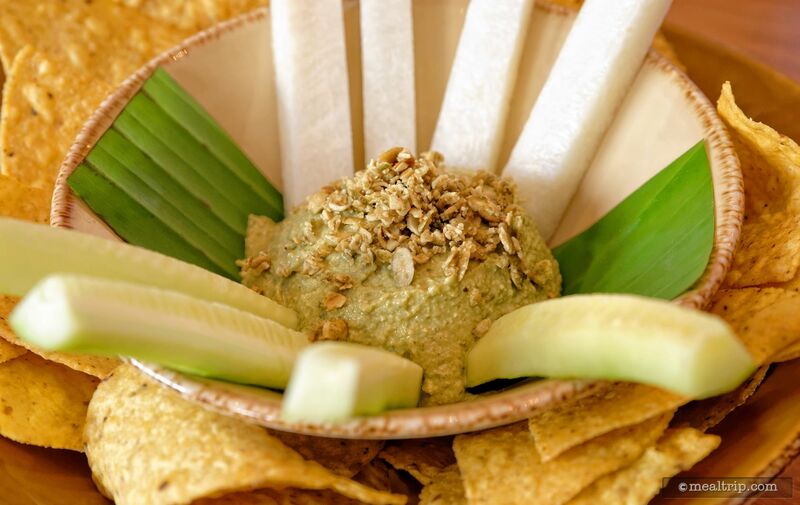 Basically, some toasted Yucatecan pumpkin seeds are pureed with some fresh lime and orange juice, fire roasted tomatoes and onions, a little tahini, just a drop of habanero hot sauce and probably a little cilantro - down to a hummus-like consistency and are served with fresh warm tortilla chips and spears of cucumber and jicama. 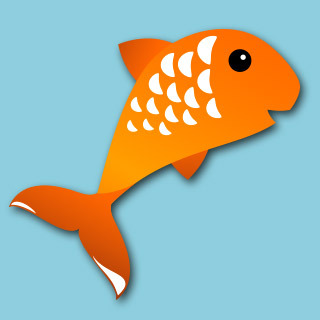 It's simple, good for you, and addicting! I also tried out the "house" margarita, simply called the "Frontera Margarita". It's good, but it wouldn't keep me from trying some of the other Margaritas on the menu. Moving on to the entrees I ordered the Baja Shrimp Tacos from the seasonal menu and two things really stood out on this plate… the Florida Pink Shrimp were just perfectly cooked in a very light batter, and those two sauces! The coating on the shrimp was as light and flaky as a tempura but a little more formed and evenly coated. I could totally knife and fork a plate of these with some rice and call it a meal. There were eight or nine decent size shrimp on the plate… piping hot and totally yummy. 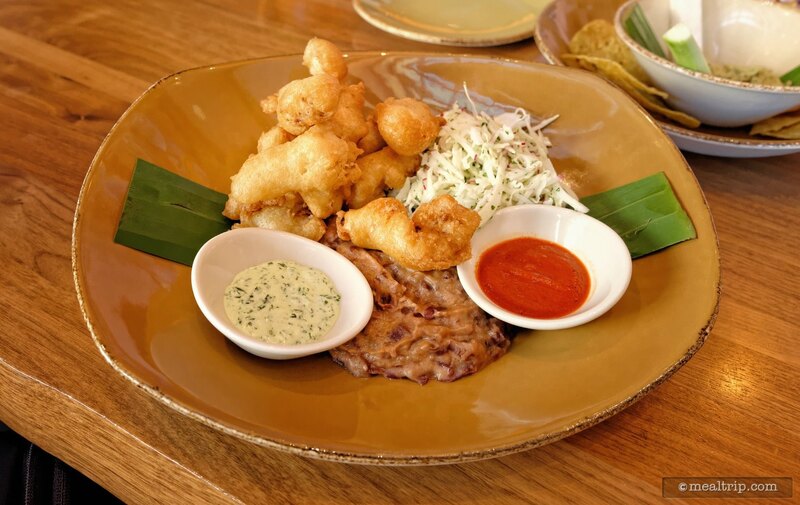 For the seafood purists out there, the batter did overpower the light fresh seafood notes of the shrimp just a bit. I've found that to be common with battered shrimp tacos in general though. The warm tortillas that are brought out in a separate dish were good… the second batch was warmer and fresher than the first batch! There was also some "garlicky red bean refritos" and cabbage slaw on the plate -- but the real star(s) of the show were the tiny dishes of Cilantro crema and arbol chile salsa. The two sauces were very different and both packed a ton of flavor into a very small space… a little went a long way and provided some variety in this "build your own taco" entree. 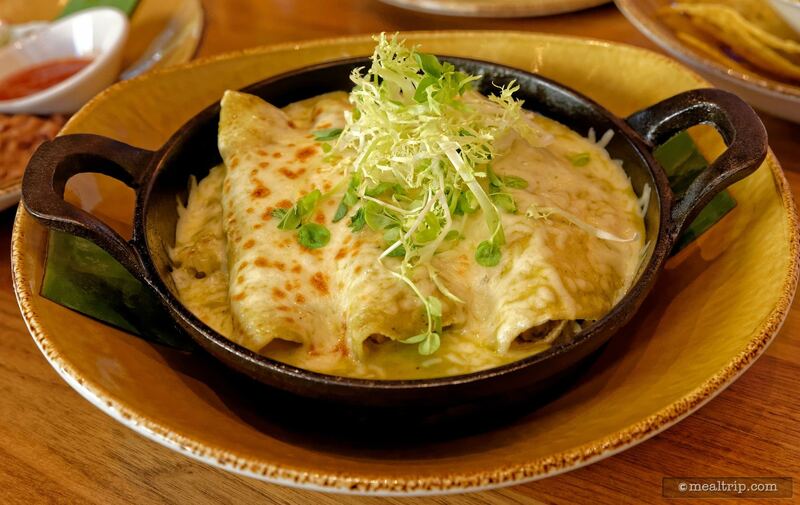 From the "normal" menu we tried "the" vegetable-based entree, some Grilled Zucchini, Mushroom, and Potato Enchiladas. The just made tortillas with creamy roasted tomatillo sauce were Mexican-authentic flavorful… and there's enough volume here so you won't go away hungry. While not adhering to a vegetable-based diet, I really enjoy sampling different vegetable-based entrees when I'm out and about, to find out where the flavors are. 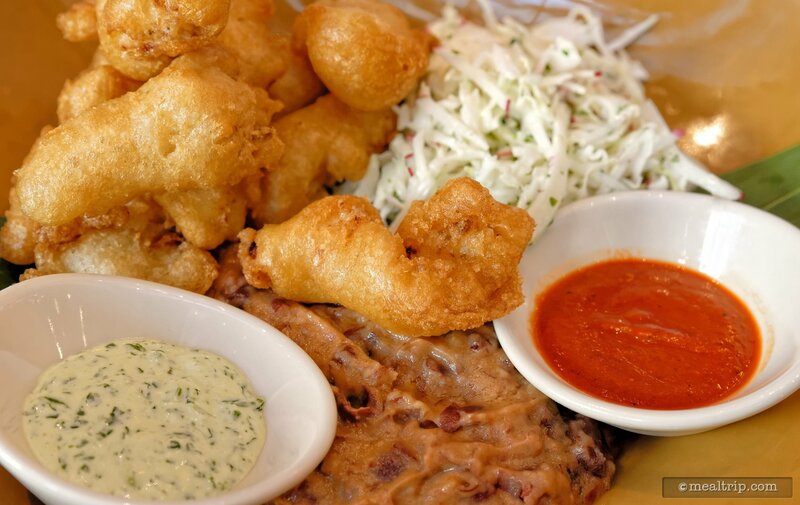 There either seems to be zero flavor or a surprising amount of flavor that would totally put the dish on par with the craveability of a meat-based entree. This one fell somewhere in the middle… I personally would have liked it to have been a little hotter (spice wise) or tasted another layer of flavor in there somewhere… but with it being the only vegetable-based entree on the menu, a middle-of-the-road approach is a safer way to go (for the restaurant). 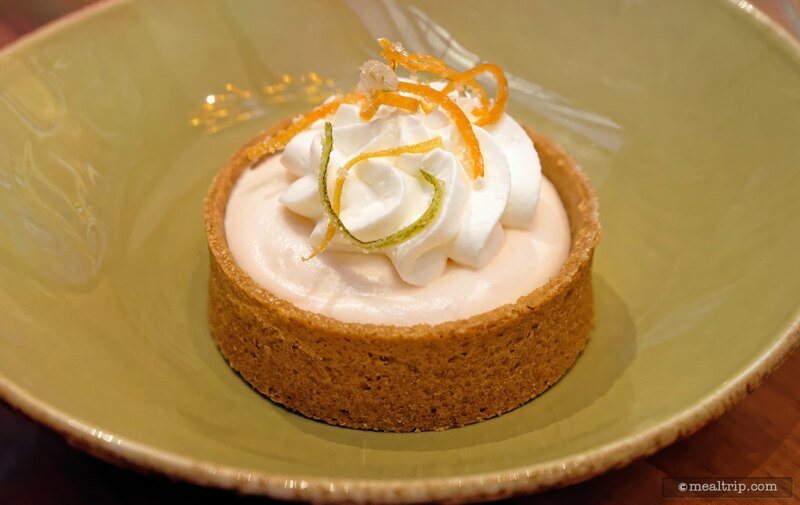 For dessert, I went back to the "Taste of Baja" Menu and tried the "Paloma Tart". 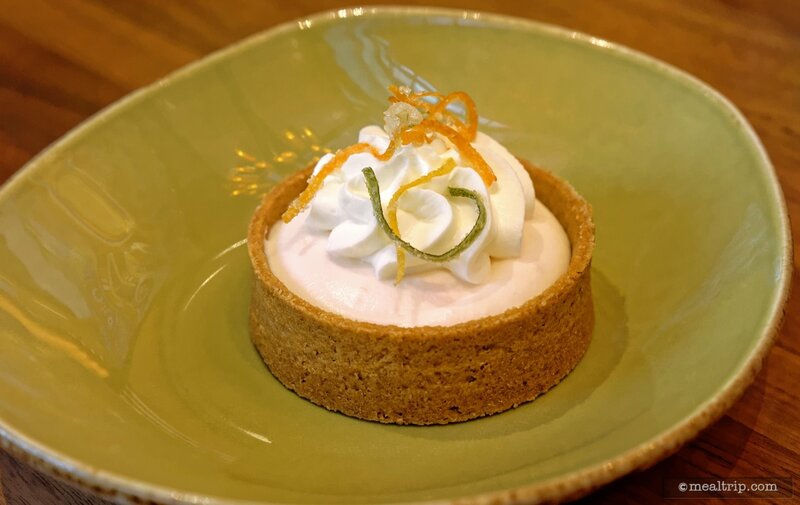 This one features a very delicate grapefruit and lime mousse with Avion Blanco Tequila, which is all placed in a graham cracker crust shell. The dessert is topped with a lime whipped cream and some candied lime, grapefruit, (and possibly) orange peels. This was a very light dessert and the tequila seemed to freshen up the lime and grapefruit without becoming too acidic. I'm generally not a fan of the graham cracker crust shell idea… this one was fine tasting… but like most, hard to break apart. All in all, a really great meal that will get a decent score from me. I really want to get back there and try a few more of the "normal" entree items and some of the other "starters" (and to get some interior room photos). 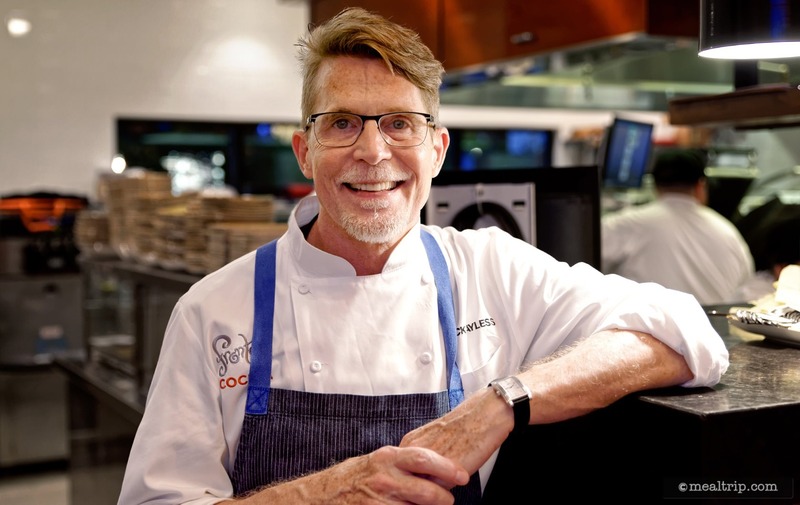 I feel like I've only tasted a hint of the amazing flavors that James Beard award winning chef Rick Bayless is capable of bringing to the table. My gut feeling is… those "award winning dishes" are in the Entrees section of the menu, with the seasonal menus offering a way to bring a little something different for those that visit more frequently.